To start off, I found this awesome recipe by Lindsay at Delighted Momma, and I knew that I just had to try it! First of all, the recipe is ridiculously fast and easy, and secondly, it’s delicious! Not only is shredded coconut a good source of fibre, it’s a great source of medium chain fatty acids. These fatty acids can be easily digested and they burn slowly – which does wonders for your metabolism (aka. it keeps you full longer)! These little seeds are a fantastic source for omega-3 essential fatty acids (EFAs). Some of their functions include: good skin health, anti-inflammatory (aka. it keeps your immune system happy), and they’re important for development and function of the brain. Chia seeds are one way of getting omega-3, fish is another great source. Just a forewarning, not everybody likes these. My parents hated them. However, you could hardly taste the difference. Cacao nibs are a great source of good fats, potassium, and fibre. Not to mention that they contain many minerals and antioxidants. Let’s focus on the benefits of soluble fibre which combines with a liquid to form a gel – this makes you feel full longer thus potentially decreases overeating. Soluble fibre is also known to lower serum cholesterol levels. This great alternative to peanut butter boasts high levels of monounsaturated fatty acids (MUFAs). MUFAs help build cell membranes and further produce other unsaturated fatty acids which have various beneficial roles throughout the body. According to botanical medicine, this liquid gold has many beneficial effects that can be seen throughout the body. It is anti-inflammatory, anti-ulcerogenic, and anti-microbial. In addition if you ever burn yourself, the anti-bacterial effects of honey will prevent fluid loss, bacterial invasion, and will promote wound healing. This is a great spice that helps lower blood glucose levels (as it increases glucose uptake in cells)! Not to mention, it essentially gets along with most foods. Great benefits have been seen in those with type II diabetes. 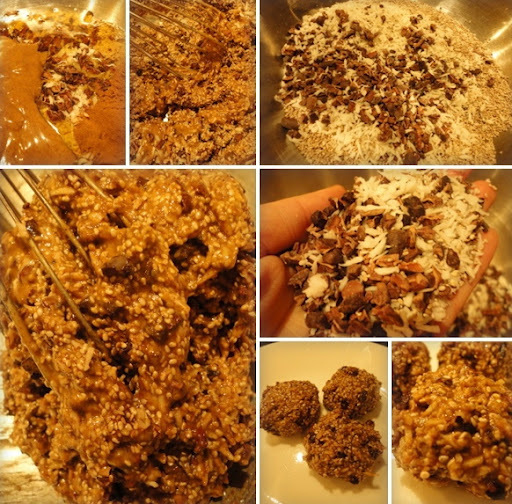 So with all these great benefits, I hope I’ve convinced you to try Lindsay’s amazing recipe. My advice let it sit for more than 30 minutes (prior to rolling), and tell all your friends! Have you recently discovered any amazing snacks?